There is never a dull moment in DeKalb County. 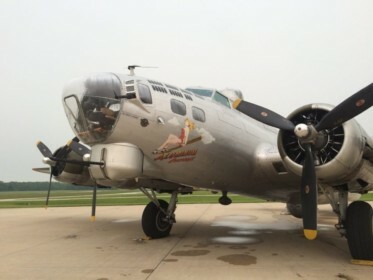 Not only do we have numerous museums that display incredible, military machinery and vehicles, but on Monday we had a very special piece of equipment come into our area: a B-17 Bomber, named “Aluminum Overcast”. This World War II aircraft, built in 1945, is one of about 10 remaining in existence. The Aluminum Overcast was not used in combat, due to late arrival by the U.S. Army Air Corps, but it was made for battle. Now, 70 years later, it is on a 2015 nationwide tour. 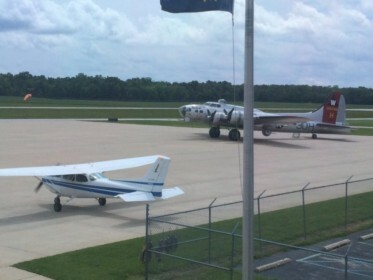 I was given the opportunity to head out to the DeKalb County airport to check it out, as well as talk to some admirable people. As I pulled up to the terminal, this piece of history was hard to miss. Its enormous wing-span and metallic aluminum exterior was remarkable. I also noticed a man dressed in uniform, and learned he was a B-17 Pilot during World War II. The Veteran, Everett Smiley, recalled, “The Army Air Force called me to duty in February, 1943”. He said most of the men wanted to fly single-engine fighter bombers, so he put in for the B-17. Smiley was in the Air-force for 3 years and said he really enjoyed flying. He flew 5 or 6 B-17s and was credited for 51 missions. 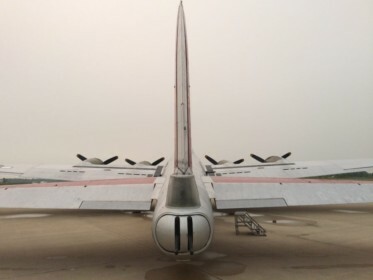 A press flight was scheduled for Monday, but due to the cloudy weather, it was unlikely that the Aluminum Overcast would be in the clear for take-off. The pilot, Rick Fernalld, had said the cloud ceiling needed to be at 1,500 ft. and it was about 900 ft. However, luck was on our side, and the cloud cover started to clear. The press flight was originally full, so I planned to stay back a watch it from the sturdy ground. To my complete surprise, one videographer decided to stay back and film the Aluminum Overcast departure, and I was chosen to take his place. I quickly signed my release form, listened very closely to the safety instructions, and boarded the amazing aircraft with the pilots, other media personnel, and veterans, two of which were B-17 World War II Pilots, Everett Smiley and Robert Tobey. I knew I was in good hands with this crowd. We entered the Aluminum Overcast through the waist section, sat down and buckled up right next to two machine guns, where the waist gunners were positioned. Once we were in the air, we were able to move throughout the aircraft. I started my journey through the waist, to the radio operating compartment. Next, I walked through the bomb bay; it was a very narrow walkway called a “cat walk”, and on both sides I saw imitation bombs. I then made my way to the Upper Turret Gunner section, where the ceiling was wide-open with a plexiglass cover. In the cockpit, there is a small space to climb down, between the pilot and copilot, which leads to the nose of the B-17. This small space was completely open on 3 sides, and where the navigator and bombardier sat. The 18 minutes that we had in the Aluminum Overcast was all I needed to obtain an experience of a lifetime. The other passengers, pilots, and sights were unsurpassable. This adventure allowed me to connect with the past, and have even more respect for those who used these aircrafts for our country’s protection and freedom. 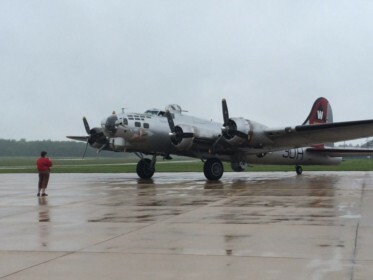 On Tuesday, the public had the opportunity to purchase a ride in the B-17 Bomber. Danny Aavang is one of them. 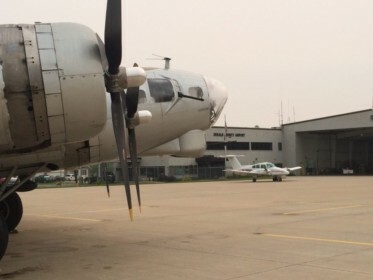 He has been a Samaritan Pilot at Parkview Hospital for 25 years, and his co-workers put money together for a flight for Aavang in the aircraft. The next stop for the Aluminum Overcast is Waterloo, Iowa on June 12th through 14th. Go to the EEA Website here to see more tour dates for the Aluminum Overcast. Also, check out our website for more upcoming events in DeKalb County at dekalbcvb.org!